I have loved hearing from all of you that are excited about my new soup themed Mondays. I am really looking forward to this series and I am glad that you are also. My goal with this series is to cover a wide range of soup recipes and ideas. Hopefully, there will be something for everyone. This series will continue throughout the fall and winter, so if this week’s soup recipe does not appeal to you, stay tuned for future recipes. I have a lot of delicious soups planned. Some of the recipes in this series will be quick and easy, others will be crock pot soups. We will cover hearty soups and some lighter healthier soups. My goal is that I that everyone will find this series helpful. I know Crock Pot Carrot Soup does not sound that interesting, but stay with me on this one. It is really, really good, even for those non carrot lovers out there. I recently split 25lbs of carrots with a friend of mine. We got them with our last Azure Standard order, and although we love carrots, 12 1/2 lbs is a lot of carrots for one family to eat. So, I had to creative in how I used them. Some in my family love carrots, others not so much. So, although a few of us would love a soup with a strong carrot taste, others might not enjoy it that much. 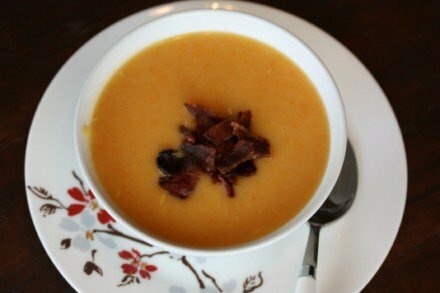 I decided that the best way to tone down carrot soup would be to add some potatoes to it. Or really what I ended up doing was tweaking a potato soup by using half carrots. Either way, what I came up with was a soup we loved. It had a slight carrot taste, without having an overpowering carrot flavor. I love how this adds a little extra healthiness to a soup and it gives us a new easy crock pot meal that we love. This soup also froze really well. I placed it in the freezer in a container. Then I defrosted it, stirred it well, and reheated it. It made for a great quick and easy dinner last night. Combine first 6 ingredients in a 5-quart slow-cooker. Cover and cook on high for six hours, or low for 8-10 hours–or, cook until potatoes and carrots are tender. Return to slow cooker and add cheese. Stir until cheese is melted. Serve in bowls and sprinkle with bacon. Hip hip hooray! I am ALWAYS on the look out for crock pot meals with very long cook times! I work an hour away from home, so I’m out of the house 11 hours a day. Now that Christmas stuff is starting to show up in stores (INSANITY! WAY TOO EARLY! lol) I think I am going to get a plug-in timer & try cooking with it. this sounds good. i made a carrot soup earlier this fall but it was very gingery so we didn’t like it so much. this sounds a lot better! 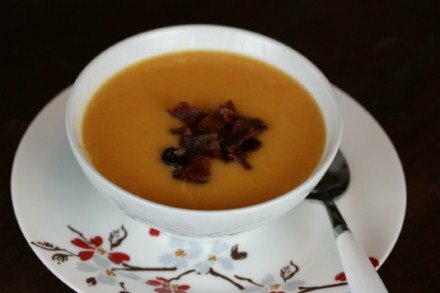 I am going to make this one but I would love to know where you found the gingery carrot soup recipe…I loved Pacific’s Carrot Cashew Ginger soup but I can’t find it anymore. Have you talked about Azure Standard before? Could you talk about it sometime? I belong to the Oklahoma Food Coop and really try to feed my family locally, but have a hard time dealing with the limited fresh produce availability. The Azure Standard catalog looks pretty big. I will try to post about it sometime. I love it for produce especially during the summer and fall. I also enjoy the frozen fruit and vegetables. Feel free to email me through my contact link at the top of the page if you want more info on it. I would be glad to help if I can. this sounds AMAZING to me. and healthy. and anything in the crockpot totally works for me! thanks! This looks GREAT and YUMMY! I love crockpot soups. I don’t know if I’ve ever made a carrot soup. Thanks for sharing this recipe. I love the fact that it freezes well! It was a 100 degrees here yesterday, but I just had to try this soup. It was so easy to make and was quite filling. The bacon was the perfect final touch. Thanks! Can’t wait to see what the next soup recipe is. Made this for dinner tonight paired with some cornbread and it is saved on my ziplist. Will definitley be making this again and again! Thank you for another yum yum yummy dinner. Thanks for letting me know that you enjoyed it! I plan to make some more of it soon, because we all loved it. I totally understand allergy issues. 🙂 I think you could give it a try and see. I am guessing that the coconut milk would be good with the carrot. Without the cheese I think you would just have a stronger carrot taste and a less creamy soup. I would love to hear how it works if you try it. This is the BEST soup EVER! Thanks for sharing this recipe! Thanks! I am so glad you enjoyed it. Made it today and thought it was okay, I don’t think it had enough carrots and I probably should have used a smaller onion. I could smell onion throughout the house, had to open a window LOL. Thank you, that is really nice. I am glad you found my site and have enjoyed the recipes. Thank you for reading! What kind of potatoes do you think would work best in this recipe? Thanks! Love your slow cooker recipes and your simple comfort recipes too. I usually use whatever I have, 🙂 Which is usually a regular baking type potato or a gold/yellow potato. I am am glad you enjoy my site and recipes. Thanks. I made this yesterday. SO GOOD! Wouldn’t change a thing. I will be adding some sauteed turkey ham that I cubed and green onions to the puree. I am making this tonight and I hope everyone enjoys. I hope my additions taste great. It sounds great, but I’ve made that mistake before. We’ll see. We did! Thank you very much for posting this. It was a fairly large amount and it was almost all gone that night and there are only 4 of us! Wow! There was only a very small bowl leftover for my mother to carry to work the next day. Great recipe. I will be using it again. Made this today. Yummo! Perfect easy winter soup. Have followed this recipe several times over the last year – ALWAYS goes down well with friends and family. Especially good now as am trying to shed a few pounds but as a vegetarian need to make sure of balanced diet! Scrumptious with warm baguette and very tasty (for me) WITHOUT the added bacon. Good way to get kids to eat their vegetables – my grand-daughters love it. Thank you so much for letting me know how much you enjoy this soup. I really appreciate it. And I agree it is a great way to get kids to eat their vegetables! You need to sell this in a restaurant for 10$ a bowl. I made it by the book only used 2lbs baby carrots and japaleno cheese because it was what I had around. Best soup I ever had! I am so glad that you enjoyed it! I am sure the jalapeno made it really good! I have frozen it in small containers for my husband’s lunches and it works fine. It separates slightly, but you can just stir it back together when you heat and serve it. I hope you enjoy it!